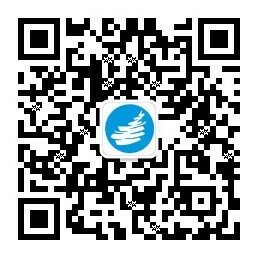 Abstract：Nanowires and nanotubes have been the focus of considerable efforts in energy storage and solar energy conversion because of their unique properties. However, owing to the limitations of synthetic methods, most inorganic nanotubes, especially for multi-element oxides and binary-metal oxides, have been rarely fabricated. 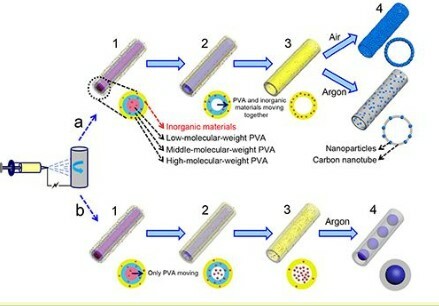 Here we design a gradient electrospinning and controlled pyrolysis method to synthesize various controllable 1D nanostructures, including mesoporous nanotubes, pea-like nanotubes and continuous nanowires. 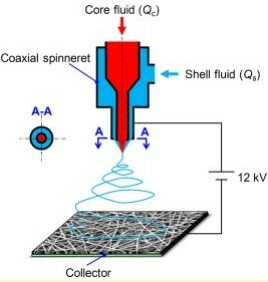 The key point of this method is the gradient distribution of low-/middle-/high-molecular-weight poly(vinyl alcohol) during the electrospinning process. This simple technique is extended to various inorganic multi-element oxides, binary-metal oxides and single-metal oxides. Among them, Li 3 V 2 (PO4) 3 ,Na 0.7 Fe 0.7 Mn 0.3 O 2 and Co 3 O 4 mesoporous nanotubes exhibit ultrastable electrochemical performance when used in lithium-ion batteries, sodium-ion batteries and supercapacitors,respectively. We believe that a wide range of new materials available from our composition gradient electrospinning and pyrolysis methodology may lead to further developments in research on 1D systems. h, respectively, reaches to the maximum of 46.4 %. The corresponding melting enthalpy (Δ H) and the crystallization enthalpy (Δ H) of these PCM/PVB nanofibers are 105.9 and 106.5 J g, respectively. 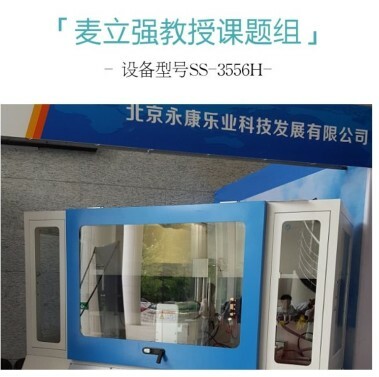 The PCM/PVB nanofibers exhibit good thermo-regulating capability under the simulated solar irradiation, regulating the temperature at around 28 °C. The resultant PCM/PVB nanofibers exhibit satisfactory stabi lit y an d rep eat abi lity in the thermo-regulating capability during repeated heating/cooling cycles. The results provide valuable guidance for environmental friendly preparation of phase-change nanofibers with satisfactory and stable thermal characteristics. Abstract： Stacked chitosan nanofibers with an average diameter of 75 nm were successfully produced by electrospinning using 5 wt% chitosan in acetic acid as the spinning solution. The fibers were then cross-linked with glutaraldehyde to remove chromium [Cr(VI)] from water via static adsorption. It was found that the adsorption correlated well with pseudo-second order kinetic model, and followed a mixed isotherm of Freundlich and Langmuir. The maximum nanofibers adsorption capacity was 131.58 mg/g, more than doubled that of chitosan powders. Common co-ions such as Cl−, NO3−, Na+, Ca2+ and Mg2+ had little or no effect on the adsorption but SO42− was an exception. Fourier transform infrared spectroscopy and X-ray photoelectron spectrophotometer analyses indicated that both amino and hydroxyl groups of chitosan were engaged in the adsorption. of the nanofibers is obtained. 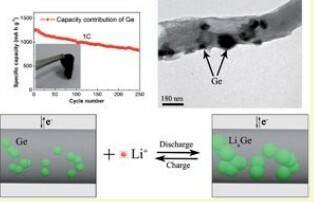 Abstract：Germanium is a promising high-capacity anode material for lithium ion batteries, but still suffers from poor cyclability due to its huge volume variation during the Li–Ge alloy/dealloy process. Here we rationally designed a flexible and self-supported electrode consisting of Genanoparticles encapsulated in carbon nanofibers (Ge–CNFs) by using a facile electrospinning technique as potential anodes for Li-ion batteries. The Ge–CNFs exhibit excellent electrochemical performance with a reversible specific capacity of 1420 mA h g −1 after 100 cycles at 0.15 C with only 0.1% decay per cycle (the theoretical specific capacity of Ge is 1624 mAh g −1 ). When cycled at a high current of 1 C, they still deliver a reversible specific capacity of 829 mA h g −1 after 250 cycles. The strategy and design are simple, effective, and versatile. This type of flexible electrodes is a promising solution for the development of flexible lithium-ion batteries with high power and energy densities. PPDO blocks. When incorporated with PVA, the interaction between PVA and PEG-b-PPDO caused a morphological transition of the nanoaggregates from star anise to small flake. 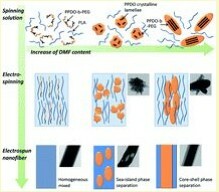 For flake-like particles, their flat surface is in favor of compact stacking of PPDO crystalline lamellae and interfusion of amorphous PPDO in the core of nanofibers, leading to a relatively ordered alignment of PPDO crystalline lamellae and well-defined core–shell phase separation. However, for star anise-like nanoaggregates, their multibranched morphology may inevitably prohibit the compact interfusion of PPDO phase, resulting in a random microphase separation.